It's quiet in the house. Nobody else is home and the cat is fast asleep. Then you hear a disembodied woman's voice let out a short, mocking cackle. No, you're (probably) not being haunted, it's just Amazon's Alexa voice assistant malfunctioning in a profoundly creepy way. "We're aware of this and working to fix it," Amazon (AMZN) said in a statement, confirming the issue. The company did not elaborate on how widespread the laugh is. In a later statement, Amazon said the device can mistakenly hear the command, "Alexa, laugh." "We are changing that phrase to be 'Alexa, can you laugh?' which is less likely to have false positives, and we are disabling the short utterance 'Alexa, laugh.'" Amazon said. "We are also changing Alexa's response from simply laughter to 'Sure, I can laugh' followed by laughter." 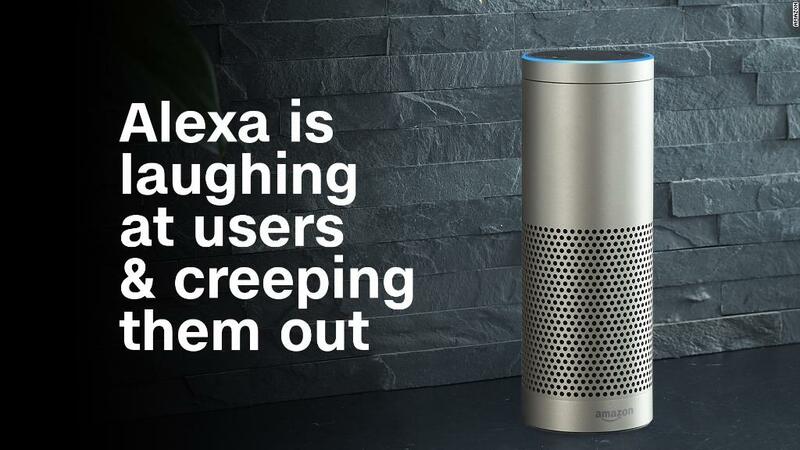 Alexa's laugh isn't the only thing that's freaking out users. Others have claimed Alexa has stopped responding to requests. One Twitter user said their Amazon Echo suddenly began listing names of local funeral homes and cemeteries, also unprompted. The speakers use always-listening microphones to detect phrases like "Alexa," and some people worry that they could be collecting additional data that could be used by marketers or even law enforcement. Audio recordings collected by an Alexa device have already been used as evidence in a murder case.